The ingredient list for this recipe may seem a little strange. Black beans and bananas? You are just going to have to trust me on this one. 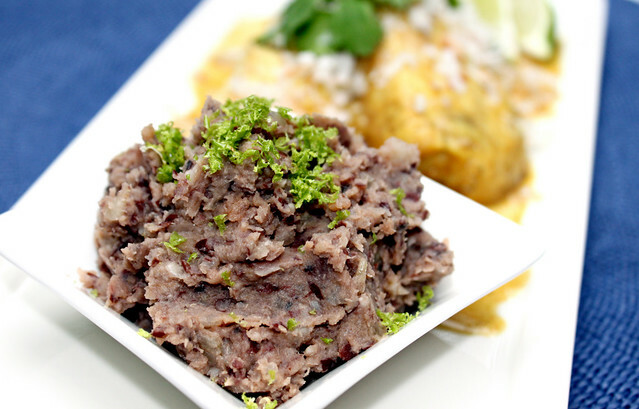 This Caribbean Bean Puree is SO yummy. I love beans in any form but I think this is my all-time favorite bean dish. I know it seems strange, but give it a try. There is just a hint of banana flavor which is balanced by the garlic, shallots, cumin and lime juice. The Perfect Pairing for this recipe is my all-time, number one, absolute favorite album…. Bob Marley’s, Legend. I have already professed my love for all things Caribbean on this blog, so I am sure this comes as no surprise. Even if you are not a reggae fan you will love this album. It has many of his iconic classics like I Shot the Sherriff, Could You Be Loved, and my personal favorite, Three Little Birds. It is the perfect thing to listen to while making and enjoying this dish. Heat oil in a large skillet over medium heat. Add the chopped shallots and garlic and cook until tender, stirring occasionally. Add the sliced bananas to the pan, cook 2 minutes, stirring occasionally. Stir in beans, ¼ cup of the chicken broth, lime juice, cumin and salt. Cook, stirring often, until all liquid is absorbed. Transfer mixture to food processor, add remaining 1/4 cup of broth, process until smooth. Serve warm.